One night a week, usually on Mondays, families apart of my church hold a family night. There are prayers, singing, a lesson and/or activity, and a treat. 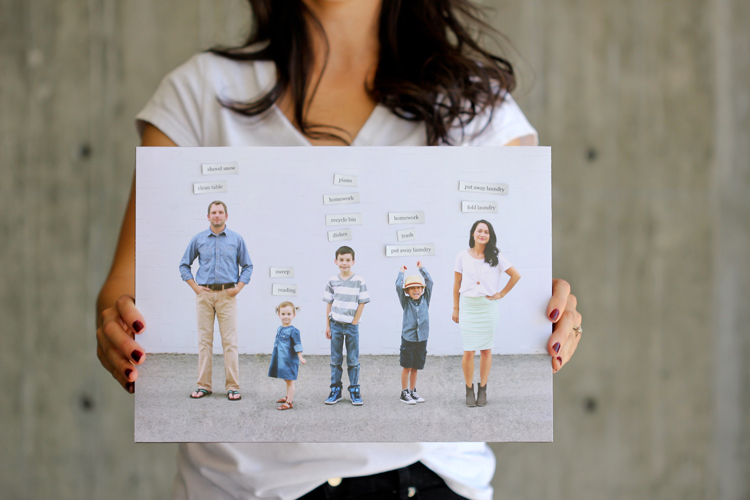 It’s a simple weekly gathering designed to help families stay strong and happy. 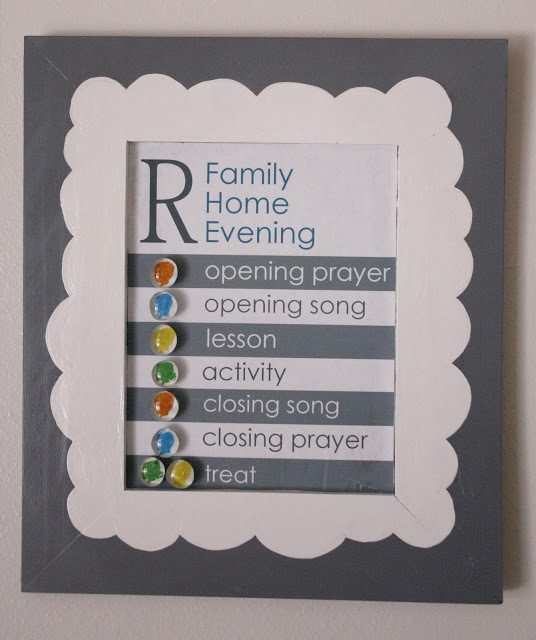 It’s called Family Home Evening or FHE and there are about a million different FHE boards and ideas to be found on Pinterest. 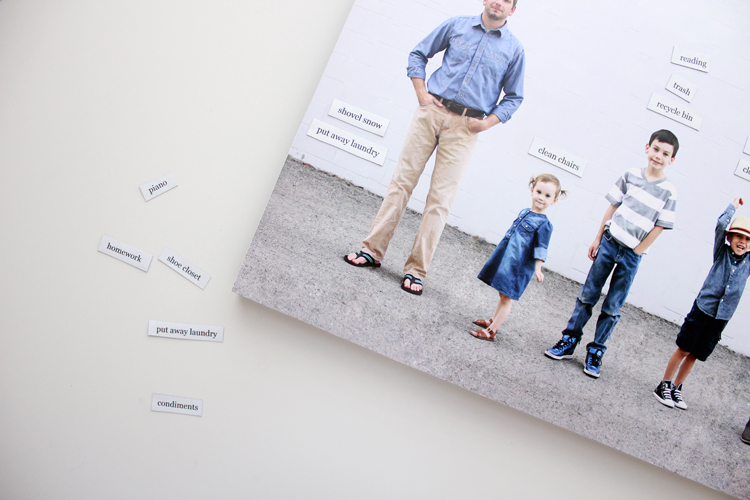 I too wanted a board to help keep family assignments organized, but I wanted it to flow naturally with our decor. The design is really flexible. 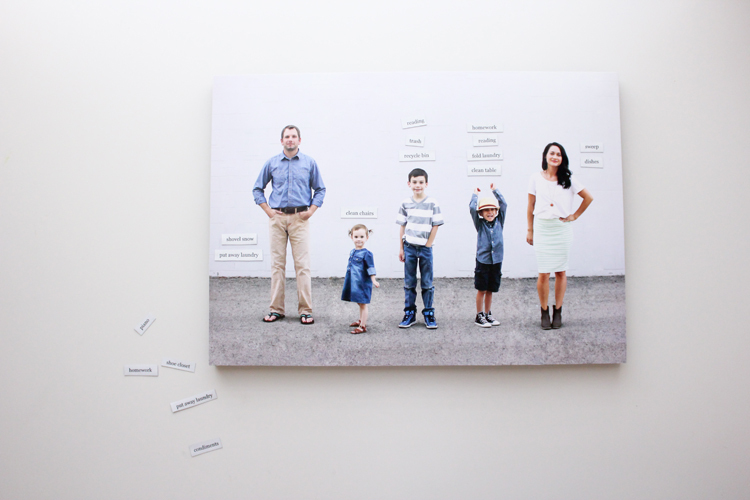 Just a photo mounted to a magnetic canvas, with magnetic words for the assignments. It doubles as a chore board as well! 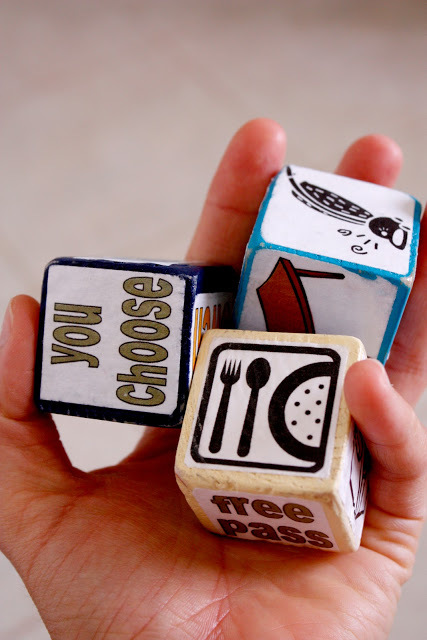 Simply move the chores around each day as needed. Let’s make one shall we? 1. Get a magnetic board/surface. I bought this magnetic chalkboard/message board at Target. You can use any magnetic surface. I chose this one, because it was already prepped and ready to be mounted. 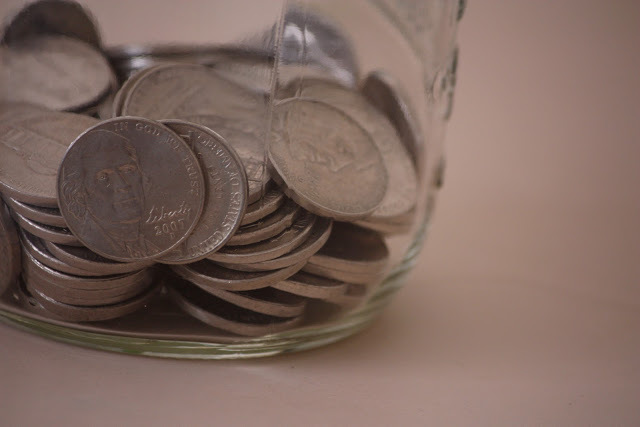 I think it was inexpensive as well…maybe under $10? 2. 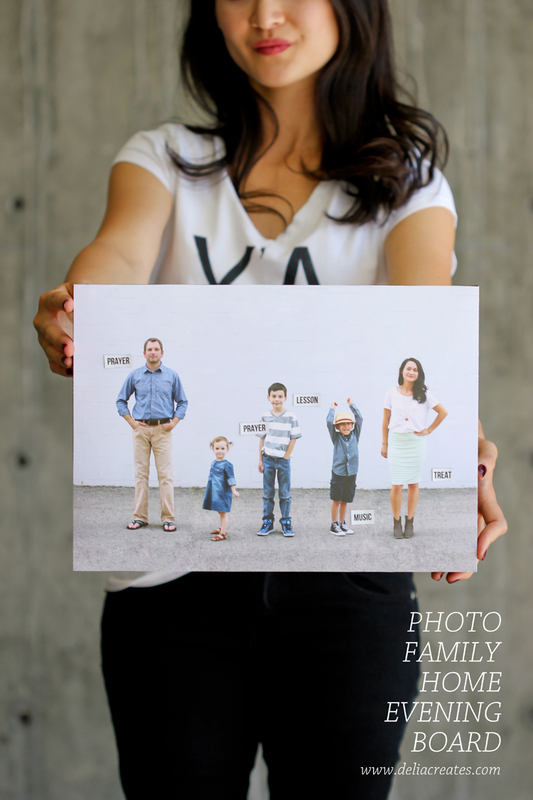 Print your family photo. 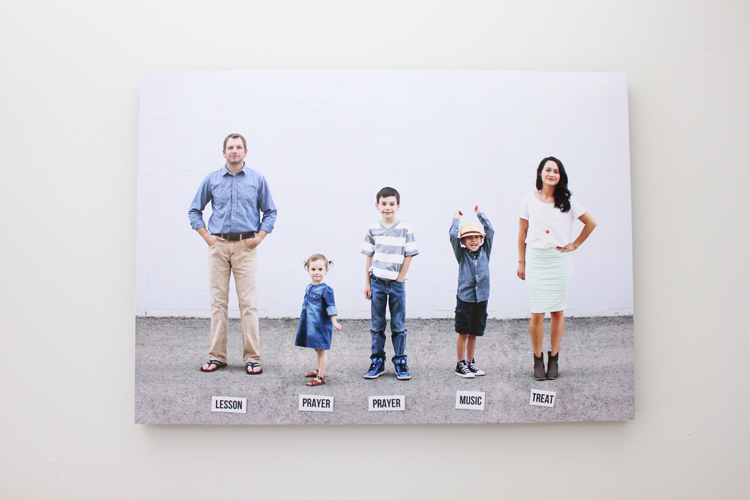 I printed up a family photo to the exact size of the board: 15.5 x11 inches. Any family photo should work, but it helps when the subjects are spaced out. 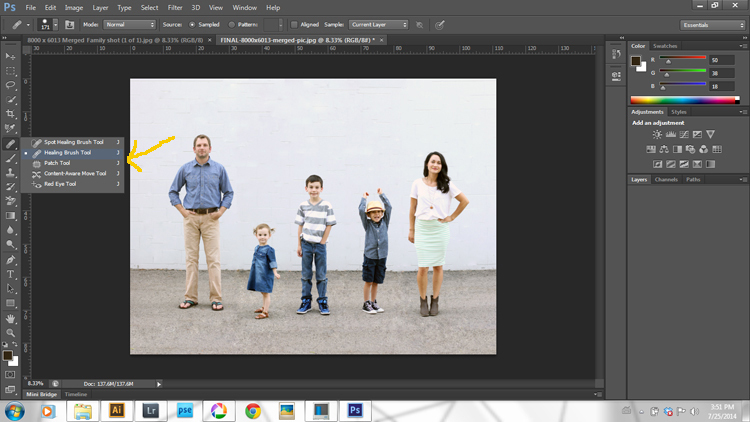 I have a tutorial on how I created my family photo HERE. You may print it at a photo lab, but I prefer to print it at a print shop like Kinkos, The UPS Store, Staples, etc. Their quality is quite nice and the paper is easier to work with. 3. 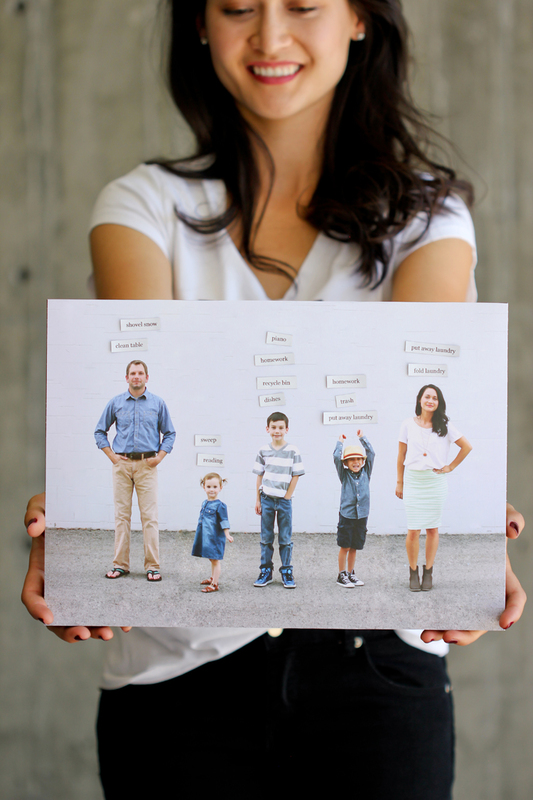 Prep your family photo. There are no standard papers sized to 15.5 x 11 that I know of, so I had to print my photo on 12×18 inch paper and then trim it down. Most printers are unable to bleed to the edges as well, so it works out perfectly to have some white space to work with. Originally, I wanted a larger piece of paper so I could wrap it onto the canvas. 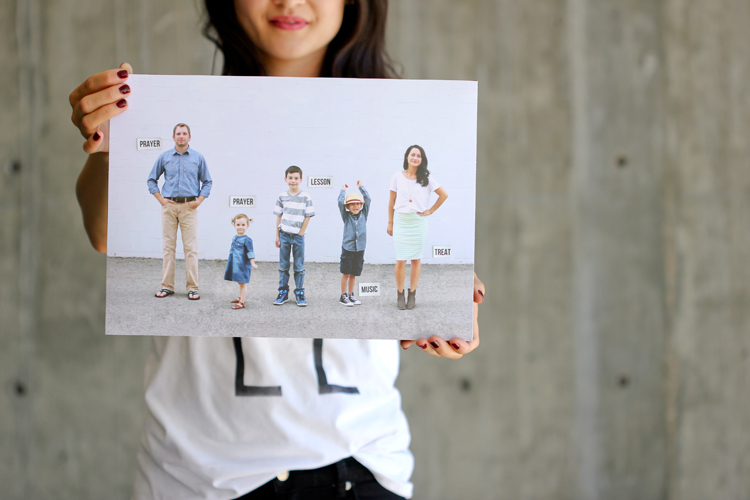 Prints larger than about 12×18 inch paper, at most print shops, have to be moved to a larger, more expensive printer. It ends up making the photo about seven or eight times the cost. So, I stuck to the smaller size and cut it to the exact size of the canvas instead. 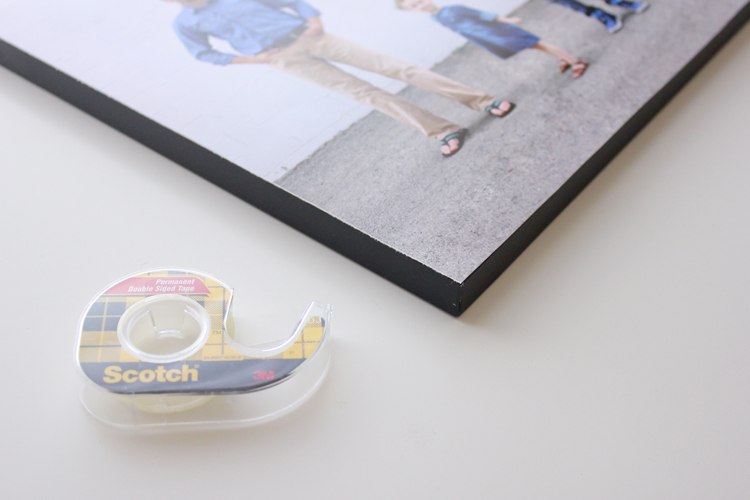 Mount the photo to the magnetic board with your adhesive of choice: spray adhesive, hot glue, mod podge, etc. I chose double sided tape because I want something less permanent. 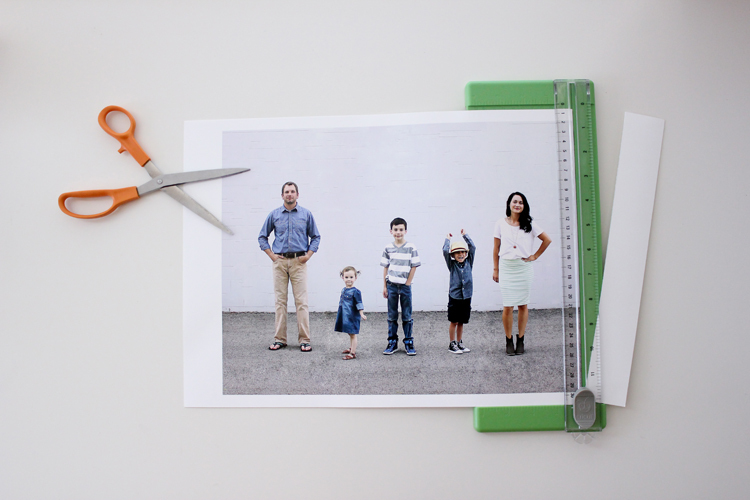 I plan on changing out the photo as my kids grow, and the flexibility of the tape allows me to do that. I don’t show it in these photos, but it is a good idea to spread a light coat of mod podge or gel medium clear coat onto the surface of the photo. 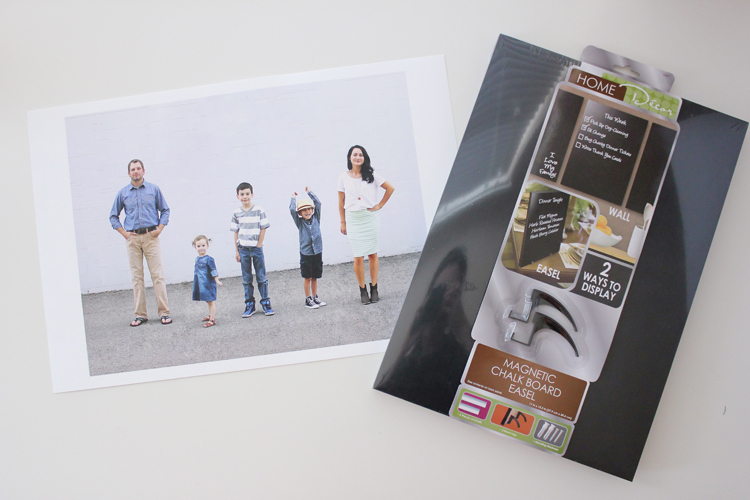 If you use a real photo with photo paper, this would be a bad idea, as the finish would ruin the photo. But for a paper photo, this can help protect it from wet fingers or smudge stains. 5. 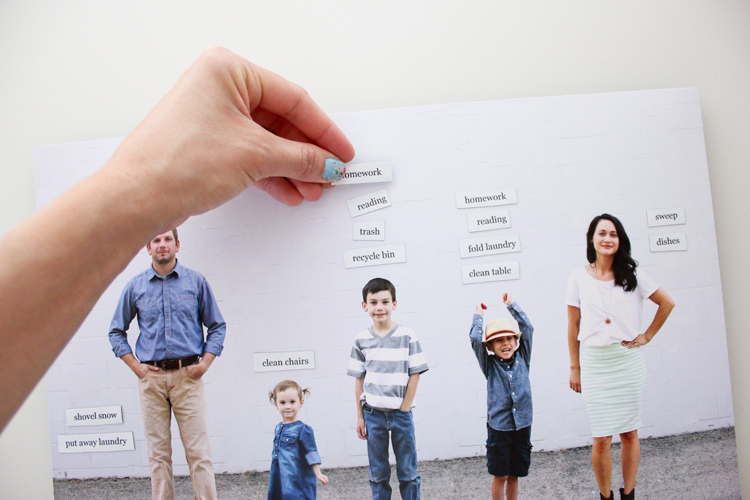 Prepare the magnetic word strips. I used magnetic paper. It fed funny into my printer, hence the crooked text. That ended up not mattering though, as I cut out each word individually anyway. I found that the best size for the text is 14-16. I know that isn’t very big, but it’s proven to be just big enough without encroaching on the photo’s aesthetic too much. A coat of mod podge on the words isn’t a bad idea either. Just be sure that the ink is completely dry before you add a clear coat, so the words don’t bleed. That’s it! Your board is ready to use! 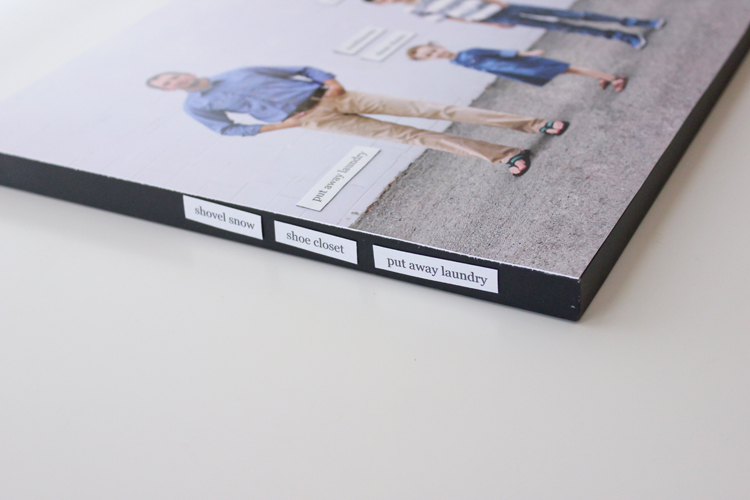 When you aren’t using the chore strips or the FHE labels, you can easily store them on the side of the canvas. Easy…right?! It’s simple, easy to use, and a harmonious edition to your home decor. Ironically, I haven’t hung ours up yet, because we are planning on moving soon. 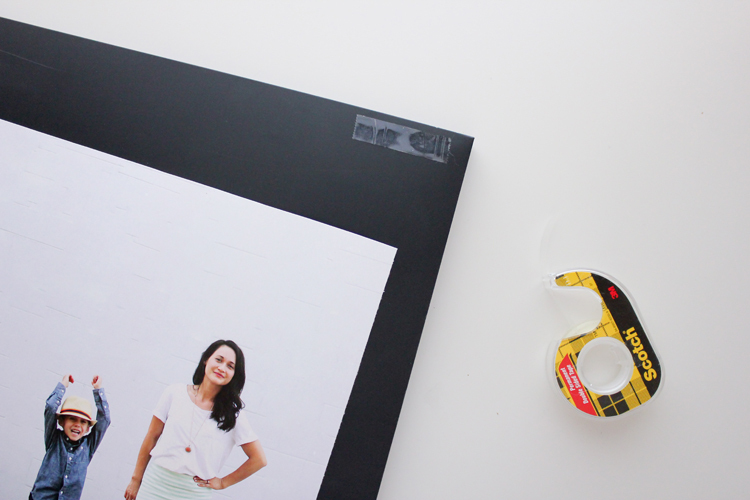 This magnetic board comes with a little kick stand so you can prop it up like a framed photo though, which helps a lot. Previous Post: « DIY Graphic Tees + Free Printables! Oh I love this idea! Very simple, and super classy! I will keep this in mind for when I have a little bit bigger kids. Our FHE consists of wrangling a 2 year old while we read a quick story in the Book of Mormon reader, and a treat if he’s not wired already! 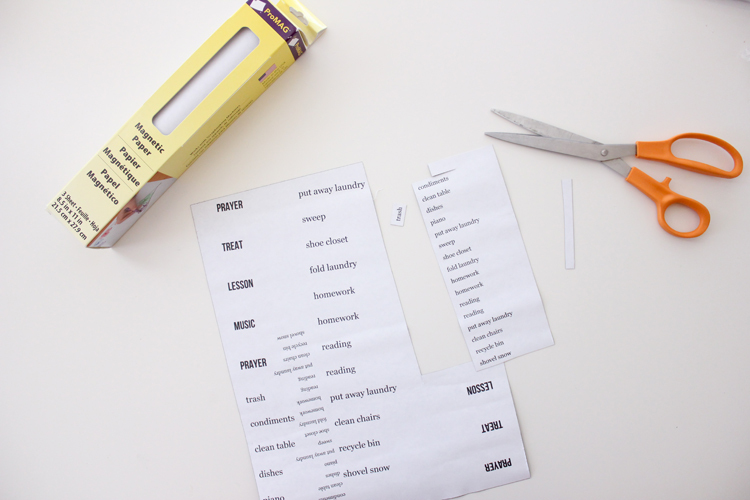 :) I love the idea of using this as a chore board too. Very cool! hahha…totally. Natalie sort of participates at this point. We try to get her to but often we are singing songs as loud as we can to hear ourselves over her screaming and shrieking! ha! I absolutely LOVE this idea and the photo itself as well. Can’t wait to hear your info about that picture as well. This is so awesome. I love how you take an idea like an FHE board and then create a totally original, fresh version of it. You are amazing and so talented. Really. You are the nicest ever. Thanks Cheri! This is awesome!! I didn’t even know they made magnetic canvas like that. I am so doing this for FHE! Maybe then we’ll remember to do it more consistently. Thanks! I didn’t either until I spotted it at Target! I was going to use some magnetic steel flashing from Lowe’s but this ended up being way better. I love this idea! And magnetic canvas? That is so cool! Wow, this is a fantastic idea! I just have to wait a little bit longer for my children to be older. At 15 months old, they just create big mess all the time! This is so cool Delia, what a great idea!! I have to admit that I did think that you had just marked x’s on the ground for your family members to stand on and threw them into a side by side collage maker, but it was so much more involved than that! You did a great job blending the background together too! I’m very impressed that you keep posting different kinds of tutorials as well, you’re like “I’m not just a sewing blogger folks.” Although I’m sure you have a backlog of sewing stuff to post about. You’re not fooling us! Amazing idea. You should probably make these for people and sell them on etsy because there are NO cute, modern FHE chart options out there. I’ll be your first customer! Aw thanks Kimberly! 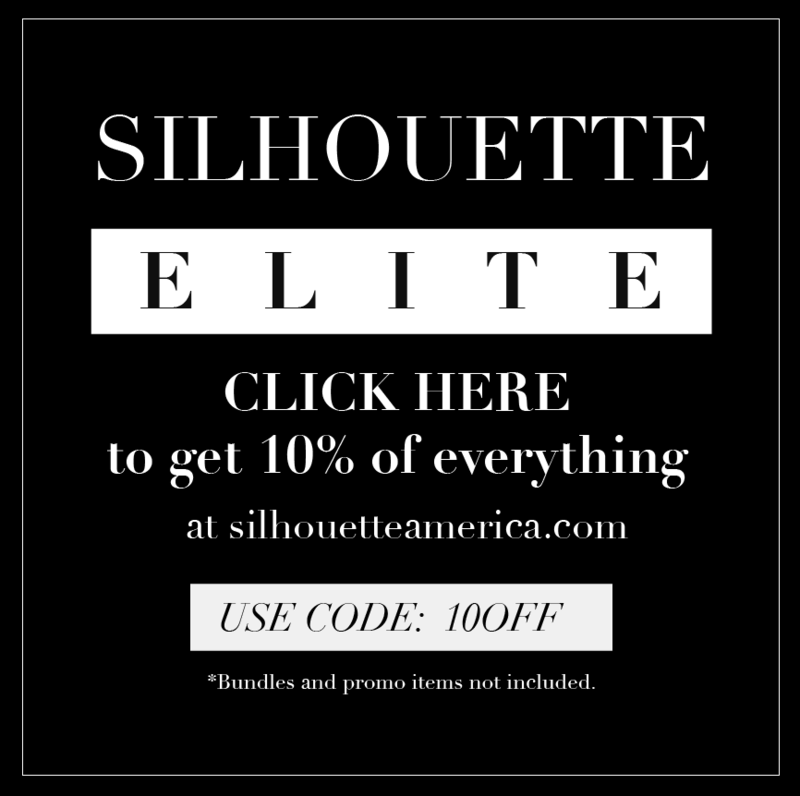 I don’t think I could juggle custom orders and a blog, but I really appreciate the compliment! What a fun idea! I am currently planning a round up of FHE charts for my blog and would love to include your idea. Would it be OK if I used one of your photos in my article? Please e-mail if you are OK with it. Thanks! Thanks! A photo with a link back is great. Thank you for the feature! Your a genius! I LOVE creative ways to use photos. I have been wanting to make an FHE board for some time but the space on my walls is coveted Lol. This is simply perfect! Thanks for sharing! I know what you mean about coveted wall space! :) Thanks DeAnn! I love this idea soooo much Delia. So fun and simple! Pinning and sharing on Facebook. Thank you!